AROUND £1.5 million is set to be shelled out on upgrading the hold baggage x-ray system Sumburgh Airport. Highlands and Islands Airports Ltd (HIAL) plans to upgrade the hold scanning machine at Sumburgh to bring it up to the highest standard recognised by the European Civil Aviation Conference. The work will include removing the current machine, as well as altering the way baggage goes through the system after luggage is checked in. 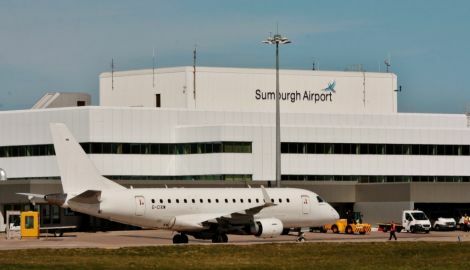 “HIAL is undertaking an upgrade to the hold baggage screening equipment at Sumburgh which will see the installation of the latest Standard 3-approved explosives detection system (EDS) machine, aimed at enhancing the customer experience,” a spokesperson said. The European Commission previously passed a legislative framework which requires airports to upgrade to Standard 3 systems in the coming years, and although it is understood Sumburgh is not required to do so due to its size, HIAL is keen to get the work done anyway as an investment for the future. Standard 3 machines are said to be easier to run, while they provide more space and use less power. The machines are said to be “significantly larger” than HIAL’s current Standard 2 machines. The news comes at a time when HIAL continues to work through plans to implement car parking charges at Sumburgh in a bid to increase revenue. The charges have been delayed since the summer after concerns were raised by Shetland Islands Council over planning issues. It is understood that these car parking charges, however, will be implemented by the end of the year.